Been Writing a blog is always filled with excitement. There are several topics and niches on which everybody can read to become bloggers and show their talent using any blogging platform. Well, after framing the most interesting SUBJECT & related blog posting content, the next step comes to its publishing. A blogging platform is also equally important to make money. Yeah, I am one of those bloggers who like to work and post the content on the blogger platform. On the Internet, I have seen endless reasons for switching to WordPress & why WordPress is must better choice. I stopped reading those posts anymore. I want my blogging platform to be as fast, functional and easy to use as possible. I understand that self-hosted WordPress is better in few factors; you own your website, you own all your content; best WordPress plugins, better SEO optimization, and all those things. But I got to know that, there is a time when BlogSpot is better than WordPress. Writing engaging and quality content is always important. However, at the same time, where you actually publish it that also that much valuable in many factors. When it comes to publishing the content online, it seems very confusing and challenging one. Confusing, because, there are many social blogging platforms available for publishing the content; so it is bit confusing and challenging to select the right one. Blogger vs WordPress for making money — Mainly, the confusion lies and the battle is Blogger Vs WordPress. Both are the most preferable social blogging platforms with similar popularity. Well, when it comes to choosing the one, the Blogger can be the right choice. Let's solve few questions; Why BlogSpot? Why choose blogger and not WordPress? Why is the Blogger better than Wordpress? What are the benefits of blogging with BlogSpot platform? Choosing the right platform ensures exposure to the right and targeted audience. It also works pulling more and more traffic for the content, only if the right platform is selected. Designing the blog and website becomes easier with a good social blogging platform. Overall, the success of the blog not only depends on how you publish it but also depends on where you publish it. The quality of the blog can only be judged when it is circulated through the quality social platform. The Wordpress platform is the choice for many professional bloggers for the good reasons. However, the BlogSpot is the best choice for the right reasons. Here, we are going to discuss how the blogger is much better than WordPress CMS. It's all depends on your own requirements. It is just like asking BMW or Ferrari? Ferrari is for faster and racing purpose, BMW is status and stability, shows professionalism branding. It's all upto you about what you need for all your needs. In previous post I have explained Why WordPress CMS Is The Best Blogging Platform than Blogger BlogSpot. 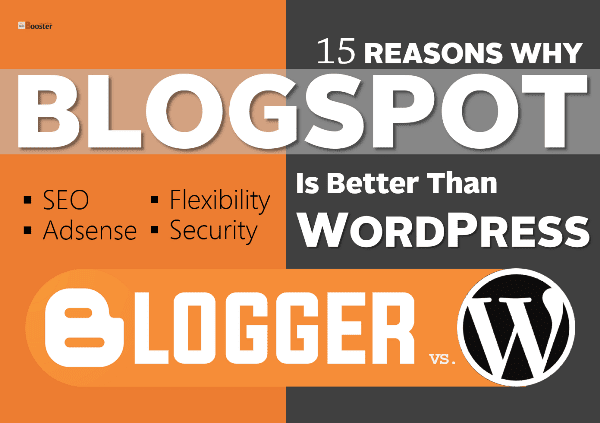 15 Reasons Why Blogger is, in fact, Better Than WordPress? BlogSpot & WordPress - These two content management services (CMS) are the most trending platforms from last few years in the blogging industry. These are the most preferable choices for the professional bloggers who showcase their work for money making blogging. For the professional reasons, there has been much discussion always takes place on 'Blogger & Wordpress' - which service is better and which service you need prefer. 1. Free to use Google AdSense. A Blogger platform is supported by the Google Adsense, and it is an important characteristic of the Blogger for making money. Once you have approved Google AdSense account, it is easy and free to put your Google AdSense ads code into the Blogger template. So you are ready to make money blogging. However, with the WordPress, this does NOT happen for free. You need to take membership first and needs to become a pro member of it. This means you have to pay money. With the Blogger, you need not require to buy any ads which are necessary in a case of Wordpress. If you want to insert Google AdSense ads codes into your template, you can quickly put ads codes into your HTML through Google AdSense or inbuild Adsense widgets, and you can start monetizing your blog instantly. This means you can make money immediately with blogger. 2. Integrated all Google products with the same account. It is possible to get connected with all the Google products with the same account with Google blogger. This is really a most valuable feature that professional bloggers can enjoy with Blogger. The Google always tends to provides different web tools and apps that can help enhance your blog. With the same account, you get access to the most useful features of Google such as AdSense, AdWords and Search Console (Webmaster tools). Just click the button, and you can have Ad banners from the AdSense that you can easily integrate into your site. It is so easy & simple to start with off. You can use the same login information for all the services made available by Google. On the other hand, WordPress is an open source solution, where you need to integrate different services manually into your blog. 3. Easy to edit templates & HTML codes. You do not require to have HTML coding knowledge or experience. Changing HTML themes & visual appearance of the blog is easy with Blogger. With the help of a number of pre-built themes & blogger templates derived from thousands of internet sites, it is easy to design and change the website theme & blog’s appearance. Unlike WordPress, your site will not get down if you made any mistakes in the HTML. While you are editing the HTML theme code in blogger, you will get the error, and you need to fix it for publishing it on the site. With the support of HTML codes, you can make many changes to the visual appearance of your blog quickly. 4. Everything is simple to work with BlogSpot. Blogger BlogSpot is really easy to work & maintain. With Blogger, you do not have to deal with the updates or any site maintenance. Blogger is popular for its simplicity. When I started blogging, I have no idea about the dashboard and its widget codes. Only because I have Gmail account, I opened an account with blogger. Initially, I mishandled, but then I figure it out. In case if you have a WordPress blog, you have to need to take care of keeping the software updated, all used plugins up to date, including your website template as well. The Blogger is very easy & fast to adopt its technology even for the new blog owner. It is truly a plug-and-play design. Blogger is the best choice when it comes to ease of use. If any, it allows you to fix any tech issues and is very simple to use. 5. The Blogger is Google’s product. The prime and most important reason, why Blogger is better, is its ownership. It is backed by the largest and most influential internet company in the world. Blogger is a Google’s product. As you know; the Google is the world’s leading search engine. It offers a worldwide platform for its blog owners in the form of Blogger tool. The blogger BlogSpot is a well known & recognized platform as the world famous Google developed it. Obviously, the Google spends most money and development time for adding more and more features to it. 6. A large blogger community to help you out. You can see there are many 'Howto' blogs & 'tutorials' are already uploaded helping the new members on how to integrate and how to start money making blogging. There are thousands of tutorial that demonstrate you from how to write quality pages to integrating the search features into the website. The blog owner can visit different blogger's blog. It offers a significant exposure to the blog owner by connecting you with existing blogs. 7. High levels of security. Blogger is safe from hackers and viruses as the security of Google well protects it. The two-step verification process enables top security to every content that is present on the blogger. The BlogSpot is not as weak as WordPress CMS, the blog hosted with BlogSpot can NOT be attacked by its database as compared to WordPress. With blogger, all your content remained safe and secured as you also get a high degree of security setup with the Google Account. 8. Quickly customize the design of your blog elements. The customization with Blogger is very easy and comfortable. With simple editing of HTML coding, you can update the template and can add more elegant widgets to your blogger blog. As the blogger HTML is based on XML + HTML and have the ability to includes JaveScript programming, you will find it more flexible while blog design. On the other hand, in a case of WordPress, the customization comes at a cost. WordPress uses server-side code (PHP) programming & a database (MySQL) which is quite difficult to understand. With the WordPress, it is very challenging to make changes in your template, various add-ons and much more. Well, the blogger comes up with different & new themes with simple layouts from time to time. 9. High-speed server for faster loading speed. The Blogger help quick loading of all your blog pages. All your content is uploaded to the Google server. Every visitor fetches those pages from the server. All your content and your blog site running on the Google hardware, so you not required to worry as they are monitoring and upgrading the best suitable for you. With simple coding and high-speed server, it is very easy and quick to load pages on the Blogger CMS platform. 10. It's FREE & user-friendly. One of the most common issues of WordPress is its hosting problem. If you are working to build a website, then you need to buy, manage & maintain web hosting. You need to PAY for space, bandwidth, RAM, CPU, etc. to keep your site live on the internet. 11. No technical skills required. Blogger is less technical and does not make the user know technical terms. It is quite simple and can be used by non-techie people. It is a really very easy platform that can easily be used by newbies blog owners and non-technical guys. For WordPress, you actually need to know technical terms before starting the blog on WordPress. Moreover, you do not require to update blogger software nor any widget. The Google takes care of everything for FREE. BlogSpot keeps you aware from hosting issues or any sudden site crashes like WordPress. You need not worry about any of those issues. 12. Automatic Indexing made easy with BlogSpot. We are blogger and traffic is our motivation. As backed by world’s top internet company; the Blogger serves the blog owner with automatic indexing. As it clearly shows that the blogger gets more organic traffic from the search engine results especially by the Google &, so the BlogSpot wins the game of success. You actually don't require to create and submit the sitemap. The blog posts get indexed in the search engines much quicker with Blogger. The automatic and fast indexing results in driving the most traffic as fast as possible. Fast indexing has great importance to increase domain authority fast. If the post does not get indexed for two days, it becomes old and may not offer the results as you expect. Better to use Blogger for blogging your content and get them indexed as fast as possible. One of the best features of BlogSpot is, it allows the blogger to have a complete back up of all the published blog posts in one click. Furthermore, the backed up file is cross-platform and can be used to import anytime to any blogging platform including WordPress. 14. BlogSpot provides free & effective spam filtering. Wordpress provides various plugins that help you control the spam. However, you need to buy premium WP add-ons for more efficient methods to prevent spam comments. In case, suppose if you become a very professional & popular blogger, your web blog has got top search ranking, then it can drive massive traffic to your website hosted on WordPress; around 2 million per month. If heavy traffic comes to your site, then your site will down. Moreover, you cannot do anything in that situation instead of waiting. Whenever your site is able to drive heavy traffic, it may be possible that your blog gets down; then you need to PAY MORE to handle such a situation for all your hosting. This does not apply with the blogger. The BlogSpot provides 99.999% uptime hosting. The BlogSpot will take care all the things required to the server any quantity of traffic for FREE. Even if you getting a very sudden flood of traffic, your BlogSpot blog will keep working, serving & running at the peak performance. Google’s Blogger is the most recognized place as it offers easy to use interface. Blogger helps you to make your post content more popular. It is the best platform the blog owner can rest & trust on. It is the platform that offers higher security to the blog content. It is the platform that shares the content quickly without wasting time. It is the platform that makes it easy for the blogger to get their blog published to the right audience. It is the platform that provides maximum blog traffic. Also, it is the platform that enables you to make money online for FREE.